Above: Remains of the motte (left) and curtain wall (right) at Huntington Castle. Huntington Castle, 2½ miles south west of Kington, seems to have been founded as the direct successor of Kington Castle, although it must be realized that the earlier history of the vill or manor is somewhat obscure. The first castle of Huntington is to be identified with Turret Castle, a motte and bailey 1 mile south and east of the current fortress. As Huntington vill was in the hands of the Crown until the 1090's it would appear likely that the first castle was constructed under the aegis of William fitz Osbern or his son, Earl Roger of Hereford. Between 1066 and 1075 the two earls held the king's lands in Herefordshire. William fitz Osbern, after invading Brycheiniog in the summer of 1070 and defeating the regal rulers of South Wales, established several castles up and down his borders between Wigmore in the north and Chepstow in the south. Turret Castle may well have been one of these fortresses. William, who had switched his theatre of operations to the Low Countries of Flanders in the winter of 1070, taking only 10 of his knightly retainers with him, was brought to battle at Cassel and there, according to Ordericus Vitalis, the Norman Chronicler, he died how he had lived, by the sword. William was succeeded in England by his second son, Earl Roger Breteuil of Hereford. Roger did not receive either the royal favour or the royal bounty of his father, and consequently at Easter 1075 he joined his new brother-in-law, Earl Ralph of Norfolk, in rebellion. The uprising was soon crushed by Archbishop Lanfranc of Canterbury. Roger was tried for his crimes and imprisoned. The earldom of Hereford consequently reverted to the Crown. King William the Conqueror, after a suitable interval of time, began to repent of the imprisonment of his relation who was also the son of his best friend, Earl William. In an attempt to restore friendly relations he sent him a gift of fine new robes, but Earl Roger in his prison called the guards together and burned the gifts in defiance of the king. The king on hearing of this insult swore in his wrath that Earl Roger would not be released in his lifetime. King William kept his promise, but on his deathbed he ordered the release of the aging earl. The earl had at least two sons and they both gave good service to King Henry I (1100-35) in the vain hope of being re-granted some of their father's vast patrimony. In fact all they secured was the castle and manor of Much Marcle in Herefordshire which their descendants held under the name of Balun until the fourteenth century. After 1076 Huntington Manor, and the castle if it still existed after the rebellion of 1075, remained in the hands of the Crown until King William Rufus (1087-1100) granted it to Adam Port as part of the barony of Kington (qv). It would seem unlikely that Adam had a fortress here so near to his major castle of Kington, which was smaller than both Turret and Huntington Castles! It is of course feasible that a knight held a castle at Huntington of Adam Port's Barony of Kington. As there are five castles in the barony (a five knight's fee barony) this is a distinct possibility, though the question must be asked as to why Adam would have granted such a powerful castle to one of his followers rather than hold it in his own hands, unless of course the castle had already been destroyed! The first certain mention of the present ruins called Huntington Castle occurs in July 1228 when King Henry III (1216-72) ordered the castle seized for the Crown on the death of Reginald Braose. Reginald had been lord of Kington where the castle had been destroyed in 1216. It can be seen from the subsequent history of Kington Barony that although Kington was still head of the barony, Huntington was now the fortress of the lordship. This change of castle obviously occurred between August 1216 and July 1228. As Reginald Braose was looting oak for his building operations between 1217 and 1224 it seems quite obvious when the new Huntington Castle was built. Huntington Castle was obviously defensible in July 1228 and was again taken under royal control in October 1228 when its new lord, William Braose, was captured by Prince Llywelyn Fawr in the mountains of the commote of Ceri. The castle was again taken over by the Crown when William, who had since his capture established friendly relations with Llywelyn, was captured in a compromising position in Princess Joan's bedchamber at Llywelyn's court! Apparently William had been plotting with Llywelyn's wife to assassinate the prince and seize the Principality of Wales for himself. Llywelyn was allegedly warned of the plot by Earl Hubert Burgh the leader of the English government, who had a personal grudge against the Braose family. In his outrage Llywelyn had Braose tried by a jury of his barons where he was found guilty of adultery with the prince's wife, and therefore treason. William was taken to a tree at Llywelyn's manor of Crogen, and there hung by the neck until dead. Apparently many of the Braose family enemies came to see the doleful end of the last Braose lord of Brecon and Huntington Castle. The death of William Braose was to bring about another war in 30 years time, though no one would have thought it then. William left four young daughters as heiresses. One took the lordship of Abergavenny to the Cantilupe family; one the lordship of Brecon to the Bohun family and one the lordship of Radnor to the Mortimers of Wigmore. A fourth daughter Isabella took the lordship of Buellt, centred on Builth Wells Castle, to Prince Dafydd the eldest legitimate son and heir of Llywelyn Fawr. The Mortimers, however, always felt that they had not received their full share of the division of the Braose lands and this was one cause of the English Civil War of 1263. In the meantime the barony of Kington with Huntington Castle passed to the Bohuns as part of their share of the Braose inheritance. In 1231 and 1233-34 Prince Llywelyn invaded the lordship and did much damage, though Huntington seems to have remained just beyond his reach. After the death of Llywelyn in April 1240, his son Prince Dafydd invaded the lordship and in 1244 defeated the armies of Ralph Mortimer and Humphrey Bohun in his attempt to regain the land and castles. Although Dafydd won his battles in the Middle March he failed to take Huntington Castle and the question of its ownership between Mortimer and Bohun was brought to an abrupt end in 1246 by the deaths of Prince Dafydd and Ralph Mortimer. Dafydd had no children, but Ralph was succeeded by his under-age son, Roger, the grandson of Prince Llywelyn Fawr. By February 1254 Roger Mortimer succeeded in being assigned certain lands in Brecon Barony as part of the Braose settlement, although the Bohun's successfully stalled from giving him anything. In November 1256 war again came to Wales when Prince Llywelyn ap Gruffydd and his brother Dafydd invaded the Marches of Wales and annexed them to the principality of Gwynedd. War generally favoured Prince Llywelyn in this period and in November to December 1262 he convincingly defeated Roger Mortimer and seized much of Radnorshire and Breconshire from the Marchers. On 3 March 1263 the Marchers counter-attacked and defeated the Princes of Deheubarth at the battle of Abergavenny. At this point the Lord Edward, later to be Edward I (1272-1307) and known as the Hammer of the Scots, arrived with an army from Gascony and transferred to Roger Mortimer the castles of Brecon, Huntington and Hay on Wye, which Mortimer claimed against the Bohuns. Two months later Humphrey Bohun Junior, the disenfranchised lord of Brecon, was amongst those who raised the standard of rebellion against King Henry III and his son and heir, the Lord Edward. This was the beginning of the Barons' War of 1263-66. In July 1264 the famous Earl Simon Montfort appeared before the walls of Hay on Wye Castle and forced its Mortimer garrison to surrender. Huntington Castle was probably also besieged, but did not surrender before Roger Mortimer himself was surrounded at Montgomery Castle and forced to surrender at the end of August. The Mortimer garrison in Huntington Castle remained true to their lord's cause and despite the many defeats suffered by Mortimer. They kept the Baronial army from occupying the castle until, on 4 August 1265, Roger Mortimer commanded a third of the Marcher army, which under the Lord Edward, defeated and killed Earl Simon Montfort at the battle of Evesham. Another baronial casualty, who in fact survived to fight another day, was Lord John Balun of Much Marcle! After Evesham Roger Mortimer took Hay on Wye Castle back and used this and Huntington Castle as a base for regaining Brecon Castle from Prince Llywelyn, who had taken the castle in May 1263. On 15 May 1266 Roger Mortimer's army was all but annihilated just short of Brecon. This disaster was followed by another Civil War with Roger marching against the Earl of Gloucester who had seized London town for the barons. As the royal army approached a novel plan was put before the king. Burn London to the ground by sending small birds with burning twigs tied to the feet over the town walls! Thankfully more humane methods prevailed and a truce led to final peace which included Roger Mortimer returning Huntington and Hay on Wye Castles back to the Bohuns as part of a general peace settlement. The young Humphrey Bohun received Huntington Castle back and immediately began planning the reconquest of Breconshire from Prince Llywelyn. Huntington Castle was undoubtedly used as a base for this operation. With this Huntington Castle ceased to be a major fortress, but found a new lease of life as a baronial centre for the governing of the lordship of Kington. In the 1370's there are many documents which detail the agricultural activities which were now operating from the castle. The old fortress was also re-mortared and re-roofed in this period. In 1402 Owain Glyndwr defeated a Mortimer army at Pilleth and once more Huntington Castle was put on a war footing and the keep and other buildings re-roofed again. The castle successfully held against any Welsh attack, but the lordship and many mills were wasted by the rebels before 1406. After this the castle was allowed to fall into decay, although the keep was still in use in the sixteenth century as a prison. By the English Civil War of 1642, the castle was totally ruinous and all fighting passed it by. Huntington castle is situated above a steep drop to the Belleau Stream, a tributary of the Gladestry Brook. To the south is relatively level ground on which stands Huntington church and the failed borough. Three-quarters of a mile to the south east of Huntington lay Turret Castle on its ridge end site. It is immediately noticeable that Turret Castle occupies a ridge end site, whilst Huntington does not. This again seems to suggest which is the older of the two. The entire castle earthworks consist of a roughly parallelogram-shaped site about 500 feet north to south by 300 feet east to west. This is then sub divided into an inner (south) and outer (north) court. The 'motte' lies at the south western extremity of the site. In every respect the size of this castle is vastly superior to the cramped site of Kington castle. The main 'earthwork' feature of the castle now appears to be the 'motte' (shown above right). 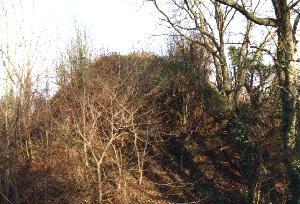 Its minuscule summit is approximately 25 feet above the upper bailey interior and 45 feet above the ditch to the west. The fact that the 'motte' rises to a pinnacle and not to a platform should at once raise questions over the validity of its description. It is in fact most likely merely the collapsed remnants of a large probably octagonal tower, now turfed over as is the fate of many such once noble structures. The primary part of Huntington Castle is undoubtedly the inner bailey which itself is internally divided into an upper and lower court. Externally it appears to be a whole. The bailey defences, which might otherwise be described as a ringwork, appear to have been formed by digging a deep ditch around the site, except to the north west where the steep slope down to the Belleau Brook precluded the need for such a feature. The steep V shaped nature of the ditch and its position against the Belleau Brook ravine strongly indicate that the ditch was and was always meant to be dry. If the castle was begun as a stone structure on a virgin site around 1220 it is to be presumed that the spoil from such a ditch was used to encase the foundations of the simultaneously rising towers and curtain of the enceinte. Other spoil seems to have been thrown out to the south and east to form an impressive counterscarp bank. The main entrance to the site seems to have been towards the north end of the eastern wall of the enceinte. To the south, commanded directly by the keep, the ditch is blocked and this probably was the access to the inner ward postern mentioned in the fifteenth century. The outer ward forms an irregular ellipse towards the east. The defences do not seem to offer what is generally expected of a strongly fortified castle outer ward. There is no real defensive rampart, but there are three apparent 'terraces' to north and south. Presumably these would also have existed to the east, but this area has been disrupted by the Castle Cottages and the approach road to them. It is to be assumed that the 'terraces' would have been graced with the hawthorn hedges planted during the late fourteenth century and later. Indeed this entire ward may date to a period much later than the more powerful inner ward. Little now remains above ground of the masonry at Huntington Castle, but the original layout with the aid of fourteenth century surveys can quite easily be suggested. What is left of the standing masonry shows quite clearly that the original mortar bonding the stones of the castle together has not weathered well. The same can be said of numerous other castles in the locality, viz Richard's Castle, Hay on Wye, Clyro, Longtown, etc, etc. At Huntington the oft heard cry of antiquarians that the walls consisted of "well fitted stone with minimal amount of lime mortar on the exposed surfaces and a core of less regular stone bonded with mud" is again encountered. Other castles are claimed to have been totally clay laid - the excuse given that lime was difficult to find in the locality. Such claims are not well founded as the accounts for the fourteenth century show. A modern house has to be repointed every 30 years or so. If they are not the external mortar is washed away by the elements and the internal mortar attacked until that too is gone - or is reduced to a substance that might be mistaken for clay or mud. Mortar has a certain shelf-life depending on its constitution and that found in castles is well beyond its sell by date! The good mortar seen in the remaining fragments of the castle undoubtedly date from the time of the excavations undertaken by Dr Logan Jack and the Ministry of Works in 1970. It is to be suggested here, as at Clifford Castle, that a major reason for the state of the ruins is the quarrying of the site for stone. At Clifford in the more inaccessible parts of the site stone still remains and in the ditches too the collapsed rubble of former structures is still piled, where it is more difficult to reach. The same is also true of Huntington where most of the 'easy' stone appears to have been carted off, though a lot of the remains seem to be turfed over and buried in their own debris. The photographs of the site in the late nineteenth century suggest that little has occurred to the site since then except for its almost complete immersion in vegetation, particularly bracken. Such would suggest that sheep have not been allowed on the site this century and would account for the sudden inundation of the site. 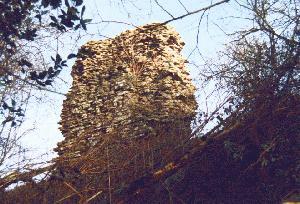 Three features exist in remains of the enceinte of Huntington Castle which suggest mural towers though only two seem to be named in fourteenth century surveys. All of these and two gates seem, not surprisingly, to have lain in the more exposed eastern and southern fronts of the castle. The northern and western sides of the inner ward were effectively screened by the steep ravine down into the bed of the Belleau Brook. The first feature encountered moving east from the keep is the overgrown site of the south tower. The dimensions currently available would suggest that this was a D shaped mural tower of an approximate 30 to 35 feet external diameter. A modern dry stone wall now covers the recently exposed levels of this tower. 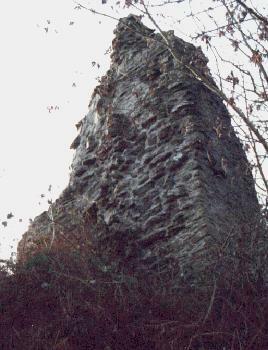 North west of the gateway is the most visible and best preserved, but heavily altered, fragment of any tower at the castle. The north tower has mostly vanished, but what remains is a fragment of its junction with the curtain wall (shown at right). The old photograph of around 1870 and the drawing of 1847 show this fragment still standing to a height of about 20 feet and obviously consisting of two stories, though there is no reason why there should have not have been a further third one, which had not survived. The masonry in the photograph seems to show a doorway from the first floor of the tower which would suggest that an internal building butted up against the tower in the same manner as one did to the south tower. The flight of steps down into the basement of the tower can just be made out and appears as it is today, partially buried. These steps were probably internal and the shape of the wall seems to suggest a building, possibly projected into the curtain immediately east of the north tower. Some 25 feet west of the present fragment stood a second much smaller 'stack like' fragment. It is likely that this formed the other return of what was probably another D shaped tower. That the tower was west of the surviving fragment is suggested also by the uncovering of a buried room in this vicinity at the turn of the century, when, according to local tradition, a cache of fifteenth century arms was found in the chamber underneath. Apparently one iron 'flintlock' with a 1½ inch bore survived at Huntington for many years before being presented to Hereford museum in the 1950's by Dr Logan Jack. The fate of the rest of the cache cannot now be ascertained. The manorial accounts of the fourteenth century speak of the Countess (of Stafford no doubt) and Reeve towers. Presumably the above are these two towers.